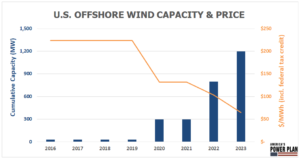 U.S. offshore wind project costs have fallen 75% since 2014, across contracts for 1.2 gigawatts (GW) of projects that will be built over the next five years. The 9 GW capacity target recently announced by Governor Cuomo in New York pushed U.S. targets to a combined 18 GW of offshore wind capacity in six Atlantic states. With all this momentum, did we vastly underestimate the potential contribution of offshore wind to our clean energy future? Offshore wind power is following a similar, but faster learning curve to onshore wind and solar over the past decade. Since 2010, onshore wind’s levelized cost of energy (LCOE) fell 66%, and solar’s LCOE fell 86%. 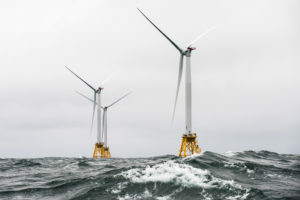 The glut of upcoming auctions and capacity targets in Northeast and Mid-Atlantic states mean the coming years will determine how fast offshore wind’s cost will fall, and the National Renewable Energy Laboratory’s Annual Technology Baseline suggests plenty of room for improvement over the current LCOE. Still, only 30 megawatts of offshore wind have actually been built in the United States to date, and consumers paid a heavy price for it at $244/megawatt hours (MWh), roughly four times what utilities pay for wholesale electricity. But recent auctions in Maryland and Massachusetts revealed fast-falling prices for new, larger projects. Maryland utilities recently executed long-term offshore wind contracts for $132/MWh over 20 years. Massachusetts utilities then cut those prices in half with contracts at an average price of $70/MWh for 800 MW of offshore wind in the Vineyard Wind project—implying roughly $90/MWh without the federal tax credit. Though there are still risks associated with siting and permitting, such as satisfying environmental, viewshed, shipping, and other local concerns, these prices make offshore wind cost-effective in the Northeast. None of this remarkable progress would be possible without thoughtful policy design. De-risking early projects through stakeholder engagement, federal and state permitting cooperation, and robust competitive auctions has already helped the nascent offshore industry climb the learning curve without placing undue risk on customers. However, even those policies won’t be enough. Complementary policies like reforming utility business models, increasing grid flexibility to complement variable renewables, and reforming wholesale energy markets will be key to a carbon-free, affordable energy future. 1) What federal and state policies should be prioritized if we want to scale and maximize the potential of offshore wind? 2) Will offshore wind maintain its price competitiveness in the face of falling energy prices in Northeast markets and the PJM Interconnection? 3) Is offshore wind more likely to play a significant or marginal role in the clean energy mix? It is good news, and a bit of a surprise to me, that offshore wind people are offering power at costs down around 7 cents per kwh, a very rapid drop since last I checked, when it had been fairly constant. Still, we were supporting lots of research with potential to reduce these costs a lot, and shouldn’t be too surprised. Nevertheless, concentrating solar power WITH storage has also dropped a lot (see http://www.werbos.com/E/GridIOT.pdf for some of the recent new things), and avoids the huge ADDITIONAL costs to the power grid which come with intermittent power sources like wind. IN any case, what ALL renewables need most is to pass the kind of bill which Pickens was pushing for many years — giving FERC the authority to approve interstate/interregional transmissoin lines, so that low cost electri city from good sites can be used everywhere. It is unconscionable that FERC has that authority for natural gas pipelines (even pipelines trampling on Indian land to help Canada export to China! ), but not for US needs. I wonder which Congresspeople claim to believe in free markets and level playing fields, even as they quietly impose a state dictated monopoly. Don’t know what you mean by this, and giving FERC additional power would be awful. They are doing just a great job evaluating pipelines using affiliated contracts as demonstration of need. AND offshore wind does not require new onshore transmission, though maybe some upgrading. Not sure how it stands now but an underwater ‘spine’ was proposed some years ago to connect the wind farms offshore from NY to VA. and bring the generation ashore at a limited number of locations, saving everyone money and limiting the issues with coastal properties. Thanks for these thoughts. With regard to concentrating solar with storage vs. offshore wind, I don’t think it’s a matter of one or the other. Not many sites are ideal for either, so we will need to pursue both options, along with other low-carbon technologies, to reach an affordable, clean, reliable electricity future. Chief among the policies to make that happen is a high-capacity transmission backbone that links resource-rich, complementary resources, e.g. offshore and onshore wind, solar, hydro, geothermal. Transmission expansion, or lack thereof, has long been a boondoggle of the U.S. power grid and others, and is essential to achieving a high share of renewables affordably. FERC backstop authority to build these lines, along with authority to delegate cost recovery to states, has been talked about at length but never seems to emerge as the dominant solution, as states resist giving up this authority to the federal government. Order 1000 was supposed to alleviate some of this pressure, but it has clearly fallen short and needs to be revisited. I would quibble with your point that there is immense additional cost related to variable resources on the system. How you measure these additional costs depends a lot on what configuration you assume the system to be at. With more flexible demand, interregional resource optimization and transmission, and more operational sophistication, we can move toward increasing levels of variable renewables while maintaining affordable power supply. One has to look at the additional costs imposed by maintaining reliability where we rely on large baseload plants that trip offline or have supply issues, and these outages tend to correlate with extreme weather events. Betting on off-shore wind is a high-risk game. Unlike the North Sea, U.S. wind turbines are in Hurricane alley—single event failure mode with climate models predicting more large storms. The Japanese have been looking at Typhoon-resistant turbines—very expensive. While the owners will buy insurance, claim it was an act of god and use limited liability to protect themselves, the grid requires expensive full back up if offshore wind becomes a major power source. Great Plains turbines have tornados—but they only take out a few machines at a time. The offshore region from Virginia to Maine was found to have the most exceptional overall resource with annual turbine capacity factors (CF) between 40% and 50%, shallow water and low hurricane risk. Based on my limited experience, to have a truly de-regulated market, policy changes should be looked at to migrate PPAs towards interconnecting transmission authorities, independent system operator. Every generating station should be a node bidding into the open market. The other policy change that should be looked at is that irrespective of source (fossil, renewables, nuclear, hydro) the onus should be on the generator to meet the capacity that they bid into the market for and prove their capacity for summer and winter runs. This would create confidence in the grid operators to dispatch renewables and also maintain the reliability and stability of the grid. I agree with you that bidders should be held accountable for the promises they make, whether on a bilateral basis or when they bid into a wholesale market. That is the effect of the capacity performance mechanisms in place in PJM and ISO-NE. But there we also have to ensure that the definition of capacity is not so artificially constraining such that only fuel-based units can qualify. For example, for storage to compete in PJM’s capacity market, it has to be able to provide capacity for 10 hours continuously, even though this is a fleeting grid need at most. Furthermore, the system operator should be able to put together a portfolio of resources that provide a sufficient probability of meeting peak or other shortage conditions. For example, a combination of demand response, offshore wind, storage, and rooftop solar may be able to provide power when the grid faces a shortage 99% of the time, but none of these resources will be able to find one another and make that bid. It is an inefficiency to force all generators to conform to a preset definition of capacity that suits the operator, rather than relying on the operator to choose the optimal resource set based on the mix. So on the supply side policy should be geared to support and incentivize projects that provide solutions which are a mix of renewables and non-renewables at the POI so that as renewable generation picks up for any hour, the GO/GOP can turndown the generation from the non-renewable source and vice-versa, this onus should be on the GO/GOP. On the demand side, policy changes would need to be made that incentivized investment in putting up charging stations for electric vehicles. A while back I had read an article in Power-Magazine that talked about what percentage of cars in Texas would have to switch to electric to have an impact on the ERCOT grid. And if I remember correctly, it was like 30% of cars charging simultaneously would require the ERCOT grid to be double of its current capacity. Policy would have to be put in place that would require gas stations to have says 20-30% of their capacity be charging stations instead of gas pumps and these charging stations should meet certain time requirements for charging from 0 to 66% charge. These measures can spur a major infusion of capital into the energy sector leading to development, and create sustainable job growth. We are headed towards a low carbon economy, and I feel policy and regulations changes are needed to meet those goals. Offshore wind will play a large role in the future and I have been so glad to see the industry growth you describe. The floating turbines are not quite ready yet but wind farms on the drawing boards are on the Mid Atlantic Bight, where the wind resource is huge and where turbines can be fixed on the ocean floor at the edge of the continental shelf. According to the Department of Energy, the U.S. has a total project pipeline of 25,434 MW of offshore wind energy as of June 2018. The MID-ATALNTIC BIGHT, or the MAB, is a continuous, shallow platform of the continental shelf that runs roughly from Cape Cod, MA to Cape Hatteras in North Carolina. The Bight’s low water depth and its proximity to the populous East Coast makes the Bight nearly perfect for offshore wind development as the turbines can be anchored to the ocean floor away from the coastline where the wind is also stronger. In the past the US has made several moves to help the offshore development. In June 2010, the Department of the Interior (DOI) and 10 East Coast states established the Atlantic Offshore Wind Energy Consortium to simplify, not toss out, the rules. In November 2010, Secretary Salazar introduced the “Smart from the Start” initiative to speed development off the Atlantic Coast. Working together, the governments “conducted a thorough analysis, ensuring future projects are sited where the wind energy potential is significant”. Environmental assessments have been made. NOAA has updated old wind maps for the region, to be used for optimum siting. Our federal government served us in the best way possible by coordinating multiple jurisdictions. An important value of our offshore wind potential is the synergistic effect of combining offshore wind with rooftop solar. Virginia’s rooftop solar potential, combined with her extraordinary offshore wind resource can meet all of our summer peak demand. For our utility concerned with meeting growing peak power demand, offshore wind is a must. This will be a big help for NYC’s peak demand. There will be a far-reaching economic boast from offshore wind …. New analysis from business group E2 found that offshore wind could triple the number of wind jobs in five Atlantic coast states (think some 25,000 construction and operations jobs), substantially benefitting the U.S. economy. And it should be said that the MA state help developing the port services for the new industry was a factor in the cost-competitive price of the Vineyard Wind project. Finally, with the expertise of offshore oil behind them, the companies that provide services to offshore fossil fuel are following Gulf Island Fabrication into the offshore wind industry. The foundations that company built for the Block Island Wind Farm were modeled after oil platforms. A huge resource that is clean, requires no fuel, will be price competitive and will expand the economy … Offshore wind is only getting started. Jane, thanks for expanding so much on the benefits of offshore wind. I have a question for you (and for the discussion here) – what do you think states should do to maximize the potential of offshore wind. Is NY doing the right thing by setting an ambitious capacity target (9GW), or is some other more sophisticated policy more appropriate? VA Governor had done last fall essentially said the same thing … Develop the onshore pieces of the industry that are required to install and maintain the offshore industry. Check out New Bedford. The same advice was drawn up for VA 6-7 years ago but as the prices were so high Dominion and the state ignored it. Seems that might have been at their own peril. Virginia, like MA has the port facilities that can be available, with help, to serve offshore wind. Now though, the consultants suggest we get together with nearby states who are already looking to do the same thing and work together. The trick to bringing down the price has, in good measure, always rested with the onshore part of the industry. Offshore wind has meant developing a whole new industry, not just selling wind. I for one am really happy about seeing the amazing resource developed.